I live in Berkhamsted, Hertfordshire, on the doorstep of the Chilterns and the National Trust’s Ashridge Estate, so we are spoilt for choice when it comes to scenic walking routes with great views. 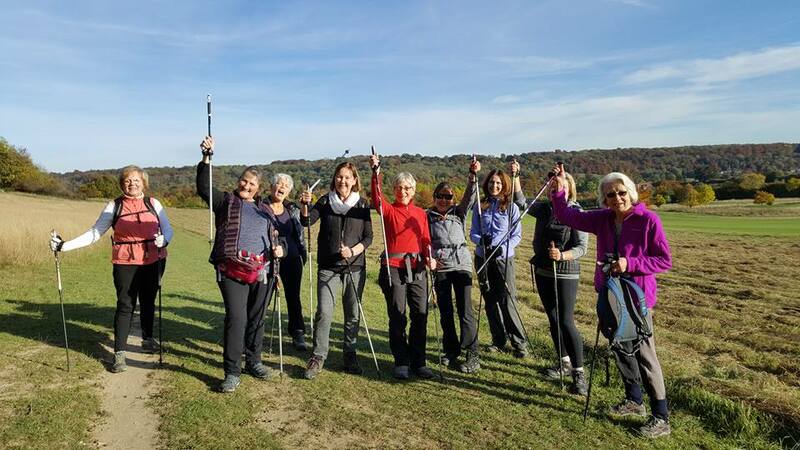 If you’re not yet sure that Nordic walking’s for you, why not join me for a 40-50min introduction to Nordic walking, for a £5 donation to our local Hospice of St Francis. Ready to learn how to Nordic Walk? Sign up for my 3 week beginners technique course and learn how to get the most out of the poles. This costs £45, consists of 3 x 1.5 hour sessions spread over 3 weeks. Poles are provided. Explore how the poles help propel you forwards on the flat, make light work of uphills, & give your knees support on the downhills. Individual sessions also available for those who prefer to learn on a one-to-one basis. Keen to walk with a group? Join my regular group walks exploring our beautiful local countryside. Meet points will vary from week to week – details of these and the walk routes will be sent out by email and posted on my Facebook page. Costs £7 per walk, or £10 for 2 walks per week, or £60 paid up front for 10 walks (plus £1 for poles per walk if needed). This may encourage more regular attendence, so your fitness will progress and you will see and feel the benefits more quickly – and this will motivate you even more! Don’t forget to share photos, walk routes and even healthy seasonal recipes with fellow walkers in my Facebook group.